A printable version of the newsletter is available here, along with the December and January calendars. This week in our Church calendar, we celebrated the feast of Nicholas of Myra. 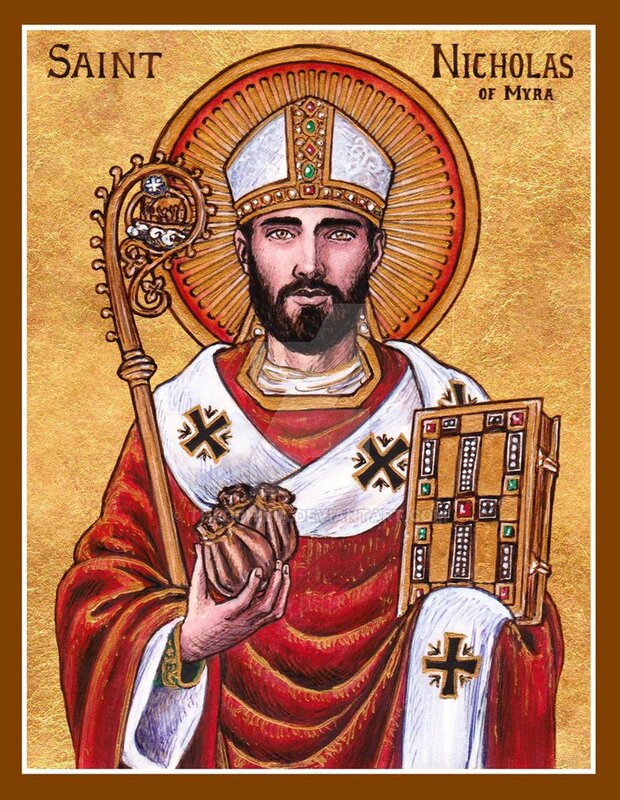 Saint Nicholas is known around the world by various names -- Nicolaos the Wonder Worker, Sinterklaas, Pelznickel, Kris Kringle, Saint “Nick”, Santa Claus – yet relatively little is known about the actual person. Nicholas was born in what is now the Mediterranean coast of Turkey to a wealthy Greek family. The nephew of a bishop, young Nicholas grew devout at an early age, and eventually his uncle ordained him a priest. Later consecrated as Bishop of Myra, he defended orthodoxy in the early Christian church – for which he spent some time in prison --and became one of those bishops to sign the Nicene Creed. There are also a variety of “miracle stories”, citing Nicholas as healing, resurrecting and saving young people and sailors in his city and in the Holy Land. However, the identity for which Nicholas is remembered most around the globe is not so much for his theology, or even his miracles, but rather, for his anonymous good works. Did you know that he was the original “secret Santa”? Although the details of the stories vary over time and location, St. Nicholas is remembered for helping impoverished families by throwing bags of gold – either in through the window, down the chimney, or into stockings or shoes – into their homes to help them. He did so “anonymously” (although, one becomes curious as to how the stories came into being, in that case), insisting that the credit be given only to God. These stories inspired a tradition among nuns, merchants, seafarers and others to give food, clothing and other rare goods to those in need around the time of the Feast of Saint Nicolas, which for us is on December 6. At St. James, we celebrated last Sunday with our “Sant Nick” processing during worship, dressed in his miter (a bishop’s big, pointy hat) and crosier (like a shepherd’s crook), and giving out chocolate “coins” to the young (and young at heart). On Tuesday – the feast day itself! – I got to celebrate with St. Jim’s Preschool students by telling them the story of St. Nicolas, while their shoes waited patiently in the hallway. What a miracle to witness their delight upon finding golden chocolates when they returned! (had St. Nick actually been there?!) There are more ways to honor this holy person during Advent, Christmas and all the year: with acts of generosity and kindness. Consider giving an anonymous gift of blankets, outerwear or non-perishables to the Outreach Office, or (non-chocolate) “coins” to the New Life Fund or Rector’s Discretionary Fund. These gifts will go to support those in our community who find themselves in need during these cold months. As with the original St. Nicholas, the glory will surely be given to God, the originator of all blessings. 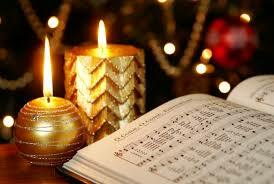 A service of “Lessons and Carols” has been part of the Anglican tradition since around 1880. It began as a Christmas service presented by choirs at large English cathedrals and schools, and it became especially associated with Kings College in Cambridge, England. To this day, Kings Choir broadcasts around the world its service of Nine Lessons and Carols on Christmas Eve. The readings and carols—which tell in sequence our salvation story leading up to Jesus’ birth—have remained largely unchanged since it began, and they always begin with the carol “Once in Royal David’s City,” sung first by a solo, youth voice. Since migrating to the United States in the 1920’s, the service has been adapted for different contexts, traditions and days. Some services take place in Advent, rather than during Christmas, and the readings may be fewer in number, and may also include readings of poetry or texts that are sacred in a different way, as well as some anthems sung by choirs or soloists. Following in that tradition on this Third Sunday in Advent (Mary’s Sunday), we offer you a shortened Lessons and Carols liturgy as this week’s Liturgy of the Word. Our six readings will include the Sunday Lectionary, as well as some poems, anthems, and carols. May it “stir up” your hearts and help you prepare for the Christ child. Very rarely does one individual or family donate all the food for 10:30 coffee hour, although this does happen at St James. 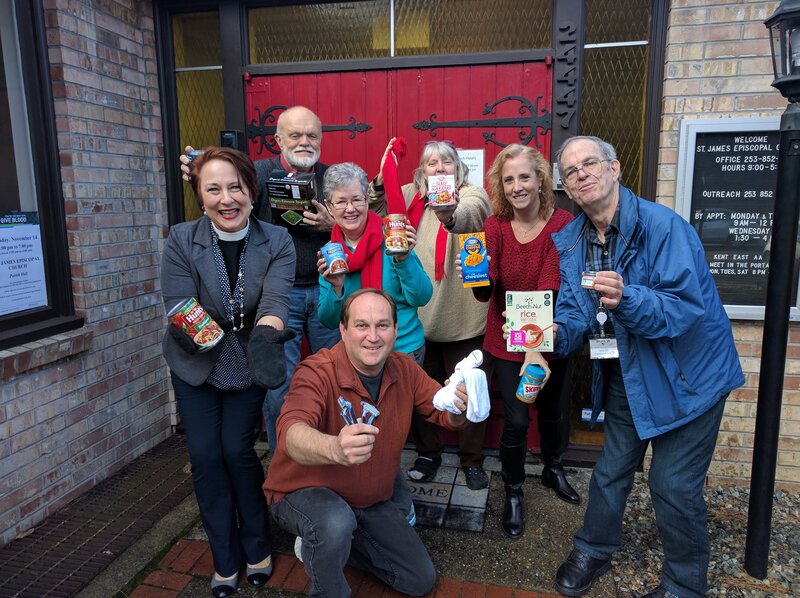 However, more common at St James 10:30 coffee hour is an assorted tapestry of small quantity of food donations dropped off anomously by several parishioners each week. People do what they can, and there are many stories behind the food donations at coffee hour. One regular volunteer donates their favorite fruit most Sundays. Another long-time parishioner, now living in assisted living, saves the wrapped cookies they receive in the evening, sometimes asking for extras so they can contribute to both the 8:00 and 10:30 coffee hours. Yet another makes a batch of their favorite cookies, and another contributes a cake to mark a personal celebration. Some people, like me, simply see something that strikes them as “unusual” or “good and ordinary” at Costco or Safeway or Trader Joes, and simply includes it with their weekly shopping. One of the jobs of the volunteer coordinator is to see to it that there is sufficient “staffing” so that no one individual gets stuck with all of the work. 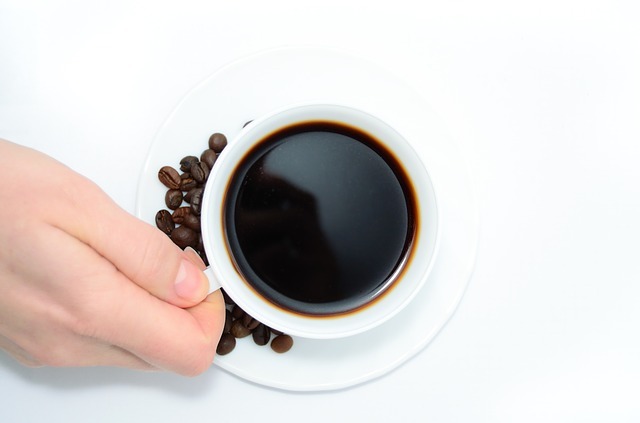 There are several tenured volunteers who know their way around the coffee hour kitchen, but we are looking to add to our list of volunteers. Soon after the10:30 Sunday morning worship, many parishioners find themselves in the Parish Hall. As the coffee coordinator for the past few months, I have see many of the same faces gathered around tables. I began to notice that some of the regulars have specific tastes they have come to expect each Sunday. Hot chocolate, coffee mocha, hot coffee and tea, juice, and an assortment of treats. Coffee hour prep begins around 9:30 when the volunteers gather to set up the coffee station and start brewing coffee. We then start the scramble for food left in the referigerator, the freezer, and cupboards. Our findings are leftovers from events held at the parish during the week, stored inventory, and some donations. In all cases we check for freshness, checking dates when available or performing a taste test to be certain our findings are suitable for consumption. Do you have a passion for compassion? Have you ever thought about working with families in need of a hand up and not a hand out? Do you have time to volunteer, once a week or once a month, with others with a similar interest? Yes? Then we hope you will consider joining our Outreach ministry team. We are looking for additional volunteers to cover hours and expand this amazing ministry. Please see Dallas or e-mail him at dshannon@stjameskent.org. If you have not seen the nursery in the last few months, please stop by and take a peek! The Vestry blessed us with $2,500 to freshen up the room for our smallest members. We thank the Vestry for their support! We also want to thank everyone else who helped with painting, furniture moving, and removing and re-installing the blinds. We started this update with new paint: a soothing blue that matches the Godly Play Room. We also added a new diaper changing station—complete with a safety belt! We have changed the doorknob to the restroom, as well, so the children can’t lock themselves in. 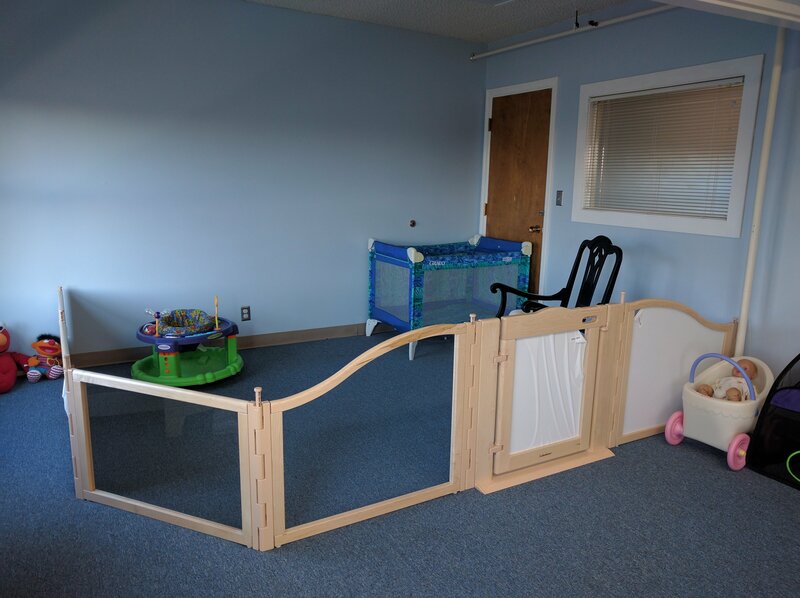 We also installed acrylic panels so we can divide the room into two parts when necessary This will let the non-mobile and the mobile kids both have their own safe space. The older children have also begun a Preschool Christian Curriculum called Frolic from the Spark House Publications. The original plan includes a mini kitchen, table with four toddler-size chairs, a small climbing toy, and an area rug. To finish the project as planned, it will cost another $2,500. We are counting on your donations to make this happen. We will gladly receive donations through the end of January. (Please put Nursery Update in the memo line.) You may put your donation in the collection plate on Sunday, or you can mail it to the church. Please contact Jan Gauthier or Jacque Alvernaz if you have any questions. Thank you in advance for helping provide a welcoming environment for our youngest members and their families! The Thrift Shop is open Saturdays, Dec. 10 and 17, from 10 a.m.–4 p.m.
Lots of Christmas décor and new inventory. Dec. 11 Pageant Rehearsal: noon–1 p.m.
Dec. 14 Advent Evening Adult Education: 6 p.m.
Dec. 16 Ugly Sweater Party: Young Adult/Young Families, 6–9 p.m.
Dec. 18 Pageant Rehearsal: Noon–1 p.m.